Yes, this is dark, but I'm posting it to say that my daughter is all done being married. As you know, she and David did a Justice of the Peace marriage back in October. That was the paper bit, the event dictated by the military in anticipation of new orders somewhere other than Groton, CT, orders that would move him but not her since she wasn't his spouse. 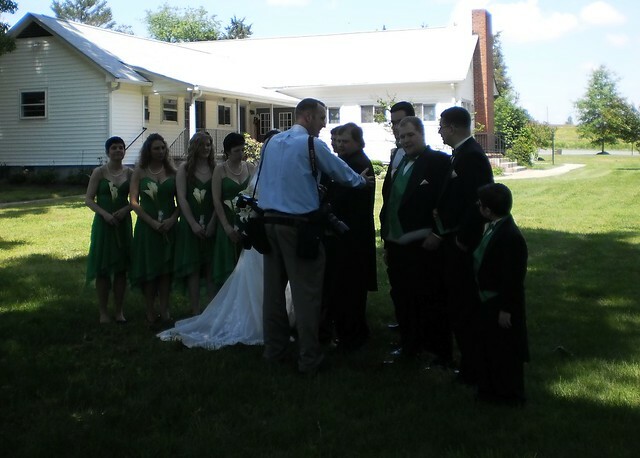 Saturday, May 21st, 2011, was the perfect day for a flawless "official" wedding in Virginia. I drove my mother to the event. My driving was probably the only way grandma would have made the wedding and, although it was a two day drive and we are both tired of being in a car, having her at the ceremony was very important to Carole. We are home now. I am posting to let all my readers know we have been there and are back again. I uploaded 197 photos which will make for a lot of blog posts over the next few days. I met up with 5 of my guild members during the trip. The day of the wedding was perfect. The wedding was perfect. It was just fantastic. My girls are happy to see us. There have been lots of ear scratches. So, I am home. Thanks for the prayers offered. The world didn't end on May 21st, in fact, it's just beginning for Carole and David.